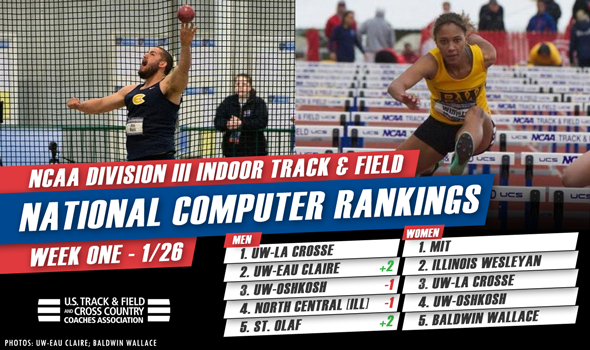 NEW ORLEANS — The NCAA Division III Indoor Track & Field season might only be a month old, but the USTFCCCA National Team Computer Rankings are getting quite the workout, specifically on the men’s side. Exactly two weeks ago, the 2016 rankings debuted with the UW-La Crosse men and the MIT women as preseason favorites of their respective genders. That much hasn’t changed. But what about those 10 teams listed behind the Eagles? Or those teams that found themselves in the 10-25 range in the women’s rankings? We’ll get to that in a second. First, here’s how we get those rankings. Scores in the National Team Computer Rankings were determined by the USTFCCCA computers using preseason event rankings that include the top marks of the recent NCAA indoor track & field seasons by returning student-athletes and the top marks of the young 2016 campaign. Marks from the outdoor season are not included, nor are marks from incoming freshmen until they compete in a collegiate meet. The closer an athlete is to the top of his or her event rankings, the more points he or she earns toward the team total. Points from all applicable athletes are added up to determine team scores. The point system used in the rankings is not the same as the scoring system used for the NCAA Championships. A full breakdown of the national rankings methodology can be found here. It should also be noted that the USTFCCCA National Team Computer Rankings should not be referenced to as a “poll,” since no voting was conducted. In the two-week span between rankings, UW-La Crosse actually fortified its spot atop the rankings. Sophomore high jumper Brendan Deiss and senior sprinter Alex Koenen turned in strong performances this past weekend. Deiss cleared 2.14m (7-1/4) and is tied for third on the Division III National Descending Order List, while Koenen clocked a 6.83 in the 60 and is also third on the chart. UW-Eau Claire moved up two spots from No. 4 to No. 2 and displaced UW-Oshkosh and North Central (Ill.) behind senior thrower Alex Mess and two junior distance runners (Nick Petersson and Josh Thorson). Mess is now ranked fifth in the weight throw, while Petersson and Thorson climbed their way up the leaderboard in the mile. St. Olaf and UW-Whitewater each jumped multiple spots as well. The Lions went from No. 7 to No. 5 thanks to their squadron of distance runners (Jake Campbell, Joe Coffey and Paul Escher). Sophomore sprinter Parker Witt (fifth in the 60) and sophomore high jumper Robert Starnes (tied for third) pushed the Warhawks into the top-10 once again (No. 11 to No. 8). St. John Fisher, out of the Empire 8 Athletic Conference, makes its first appearance in the top-10 in program history. The Cardinals moved up three spots from its preseason billing thanks to sophomore Mark Vanmarter in the long jump (third on the NDOL based off his leap last weekend) and senior Kyle Koehler in the shot put (fourth on the NDOL). Other teams to make big jumps in the rankings include UW-Platteville (No. 24 to No. 14) and Wesley (No. 29 to No. 18). This is the Pioneers’ best ranking since 2013 when they hovered around the top-10 all season. From top-ranked MIT to No. 9 Johns Hopkins, there weren’t any changes from the preseason rankings. But after the Blue Jays is where the fun begins. St. Lawrence, out of the Liberty League, jumped 10 spots from No. 20 to No. 10 behind senior Marisa Turner’s climb up the NDOL in the high jump. Turner is now ranked fourth in the event after her leap of 1.70m (5-7) two weeks ago. This is the Saints’ sixth time in the top-10 in program history. UW-Eau Claire and Washington (Mo.) each rose two spots in the rankings. The Blugolds went from No. 13 to No. 11 after junior Sarah Glidden captured the second spot on the NDOL in the high jump. The Bears have sophomore mid-distance runner Emily Warner to thank after she jumped up to fifth in the 800 (2:13.39). Other programs with notable increases include Buffalo State (No. 23 to No. 16), Nebraska Wesleyan (No. 21 to No. 17) and Middlebury (No. 30 to No. 25). This is Nebraska Wesleyan’s highest ranking since 2011 (15th). The first dual meet rankings of the season also came out and the MIT men and Ithaca College women are leading the way. In the men’s rankings, MIT is one of three programs from New England in the top-3. The Engineers have 159.53 points, followed by Williams with 143.93 and Worchester Polytechnic Institute (WPI) with 133.75. Over in the women’s rankings, Ithaca College (151.22) topped Williams (137.90) as well as MIT (137.28). Here is an explanation on how these points are tallied. You can find the rankings here.